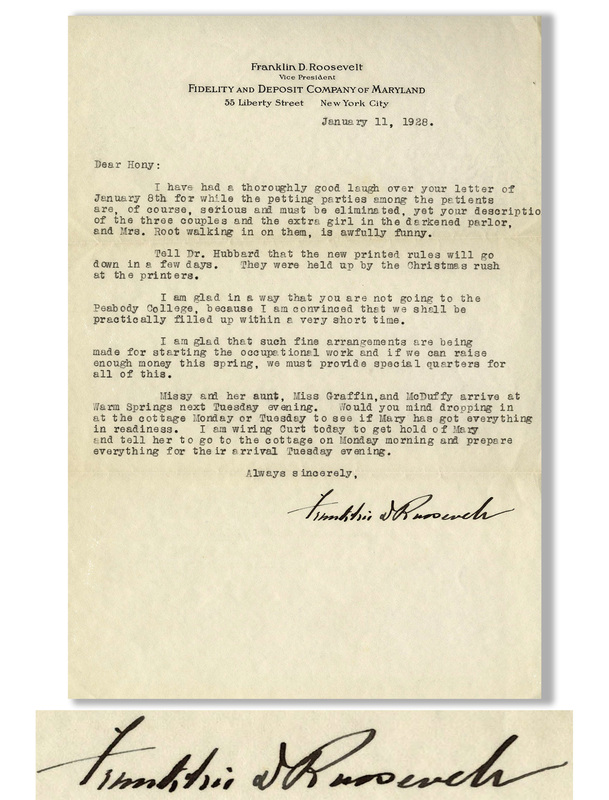 Franklin D. Roosevelt typed letter signed to Helena Mahoney, his personal physical therapist, and also the lead therapist at the Warm Springs Institute that FDR founded for polio rehabilitation. 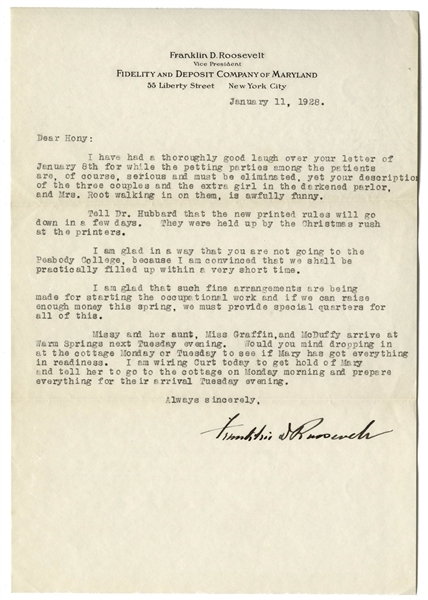 Letter upon Roosevelt's stationery is dated 11 January 1928, shortly after Warm Springs was opened. 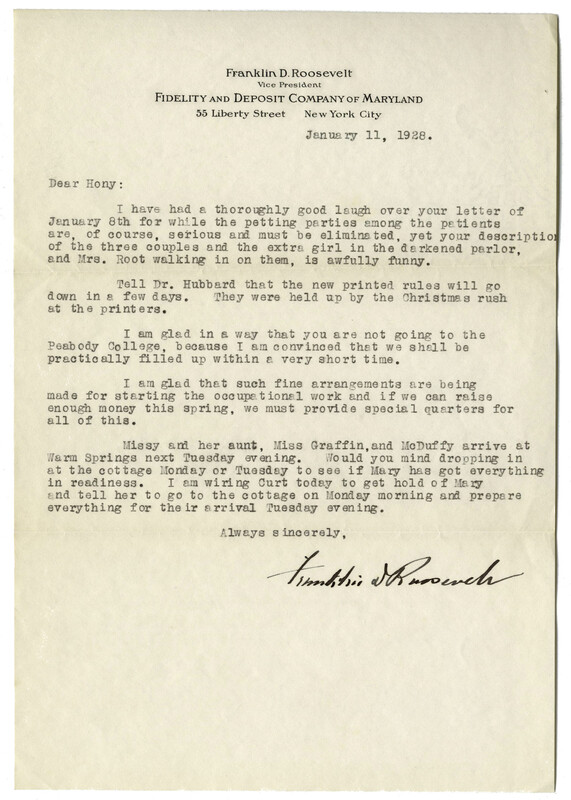 Letter reads in part, Dear Hony: I have had a thoroughly good laugh over your letter of January 8th for while the petting parties among the patients are, of course, serious and must be eliminated, yet your description of the three couples and the extra girl in the darkened parlor, and Mrs. Root walking in on them, is awfully funny. / Tell Dr. Hubbard that the new printed rules will go down in a few days. They were held up by the Christmas rush at the printers...I am glad that such fine arrangements are being made for starting the occupational work and if we an raise enough money this spring, we must provide special quarters for all of this. 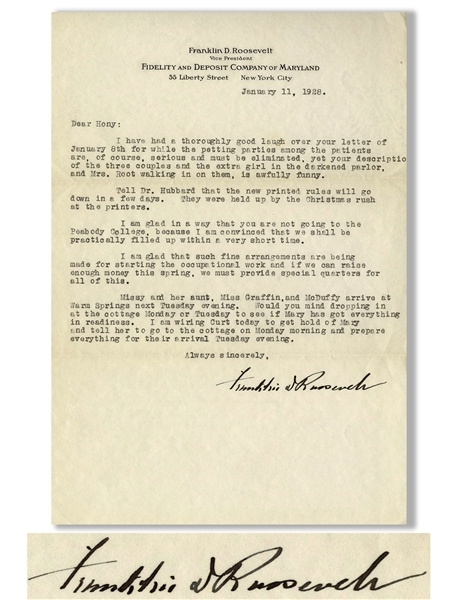 / Missy and her aunt...arrive at Warm Springs next Tuesday evening...[signed] Franklin D. Roosevelt''. Letter measures 7'' x 10.5''. Folds, else near fine condition with a bold signature.